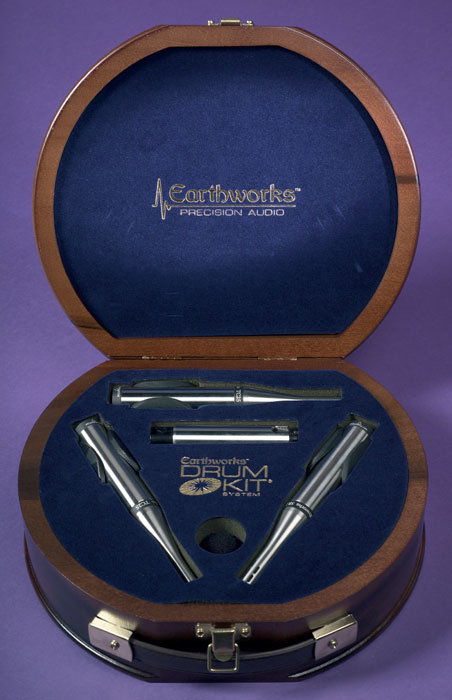 For anyone not already familiar with this American manufacturer, Earthworks were established by David Blackmer — the designer behind Dbx — to make measurement and wide-bandwidth recording microphones, along with some bespoke preamps. Since those early days the product range has expanded with several distinct microphone lines, preamplifiers, and monitor loudspeakers, many of which have been reviewed in the pages of Sound On Sound over the years. The original Earthworks QTC1 (now the QTC40) microphone is still one of my favourite omnidirectional mics, and I was very reluctant to return the Earthworks Sigma 6.2 monitors after reviewing them back in SOS April 2003! For the purposes of review, I received the DK25/R kit, which is aimed at recording studios and incorporates a pair of matched TC25 omni mics for use as overheads, plus an SR25 cardioid kick mic and a Kickpad adaptor (of which more later). The other kit, the DK25/L, is more intended for live-sound applications and contains a trio of cardioid SR25 microphones plus the Kickpad adaptor. The choice of cardioid overhead mics here allows maximum gain to be applied before feedback in stage — omni overheads would tend to howlround at much lower gain settings than similarly placed cardioids. However, there is no reason why you shouldn't use the live sound set in the studio, if you wanted to. Both kits are supplied in smart cases, the DK25/R in a very nice wooden case and the DK25/L in an aluminium briefcase. Despite containing only three mics, these two kits provide all that is needed to capture a clean, exciting drum sound. Personally, I find the minimalist approach refreshing, but I've always been a keen supporter of simple mic techniques anyway. 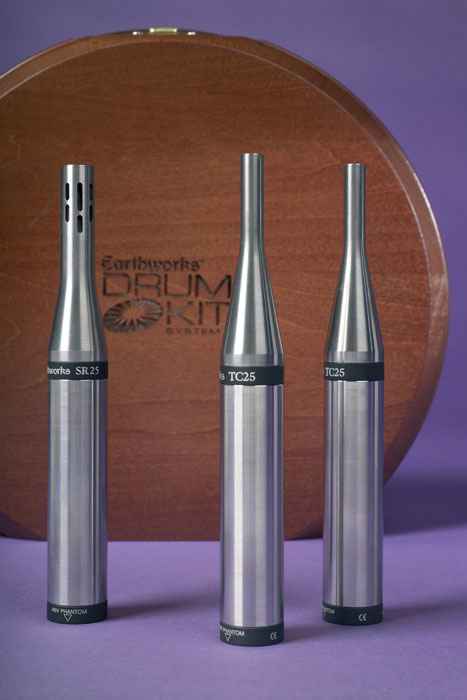 For anyone who starts to quake at the thought of not having a mic over every drum head, there's nothing to prevent you from using as many additional close mics as you like in concert with the Earthworks set — if that's the way you like to work — but after listening to the output of the three Earthworks mics on their own, you might find yourself reviewing your preferences. While the three-mic approach obviously leaves little potential for adjusting the balance of different elements of the drum kit in post-production, the absence of inter-mic delays and phase errors bestows a much more natural sound quality with greater impact, especially if the recording is done in a complementary-sounding room. As mentioned earlier, the DK25/R set is supplied with a matched pair of omnidirectional TC25 mics for use as overheads. The mics measure 165mm in length, with the main body being 22mm in diameter, but the business end narrows to a pencil-like 8mm shaft. The capsule diaphragm is roughly 5mm in diameter, which is very small indeed, and protected behind a fine wire grille. Each mic weighs 160g and is supplied with a stand adaptor that holds the mic within a soft rubber grip. Unusually, a silicon rubber loop has been fitted in and around the support bracket and this appears to be intended to increase the bracket's grip — something that's quite important for an overhead mic! The stand adaptors are designed to fit 5/8-inch threads, and the review models did not come with 3/8-inch adaptors — a surprisingly common frustration where American manufacturers are concerned. The particularly small diameter of the mic's diaphragm is a key contributor to its wide frequency bandwidth of 9Hz-25kHz between the -3dB points, as well as to its extremely tidy transient behaviour. However, the downside to a very small diaphragm is an inherently high self-noise figure: in this case self-noise is specified as 27dBA. To put things in perspective, the AKG C4000 large-diaphragm back-electret mic matches the TC25's 145dB maximum SPL rating, but boasts a very impressive 8dBA of self-noise. Given that each 6dB of difference here represents a doubling (or halving) of noise amplitude, you can appreciate just what a difference there is! To be a little fairer, the DPA4004 (with its half-inch diaphragm) quotes a self-noise of 24dBA with a similar maximum SPL rating. Fortunately, drum kits are inherently loud things, and the ability to cope with high transient peak levels is generally far more critical than the residual noise floor. Thus the relatively high self-noise figure of the TC25 is unlikely to be a problem in this context. 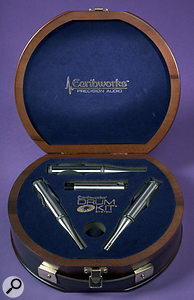 However, using the Earthworks omni mics as a distant pair on a grand piano or choral recital would be a different matter altogether! To complete the specifications, the TC25's nominal sensitivity is a modest 8mV/Pa and the mic pulls the maximum allowable current of 10mA from a standard 48V phantom supply. The microphone's current demands are worth noting, because the phantom power supplies in some budget mixers and portable mic preamps don't comply with the IEC standard and simply cannot supply the maximum rating of 10mA per mic without allowing the supply voltage to fall, potentially reducing mic headroom and causing transient distortion. The SR25 cardioid microphone is designed for recording the kick drum. This model has the same overall dimensions and weight as the TC25, but the capsule 'stalk' is slightly wider, measuring about 12mm in diameter, and has a number of different-sized slots near its tip to allow sound to reach the rear port of the pressure-gradient capsule. With the slightly larger diaphragm, self-noise is almost 6dB lower than that of the TC25 at 22dBA, while the maximum SPL remains 145dB and the sensitivity is slightly higher at 10mV/Pa. This mic also draws the maximum 10mA from standard phantom power, and the frequency response is quoted as 50Hz-25kHz ±2dB. It feels odd to place such a small and delicate-looking microphone close to a kick drum, but the SR25 is easily capable of handling the abuse, and delivers a very creditable sound provided that a little care is taken to position it. The large pressure waves created by a kick drum can easily overwhelm a pressure-gradient mic not specifically designed to cope with such things, and Earthworks recommend angling the SR25 mic at 45 degrees to the kick drum head to reduce the pressure gradient at the mic capsule. An open-foam windshield is also provided to reduce the transient airflow further if excessive diaphragm excursion (resulting in nasty popping) proves to be a problem. Although no specifications are given for the Kickpad, a quick check using a Terrasonde Audio Toolbox suggests that the device attenuates roughly 12dB below about 100Hz, this attenuation increasing to form a dip of nearly 30dB centred on 500Hz and then decreasing to about 15dB cut above 2kHz. In other words, the Kickpad introduces a fairly typical kick-drum EQ shape, boosting the fundamental around 80Hz and the click above 2kHz, while sucking out the mid-range frequencies. This adaptor is not designed for exclusive use with the SR25 mic — it can be used with any balanced microphone to provide a generically equalised and attenuated kick-drum sound. Earthworks microphones all seem to share a special character when it comes to transient detail, and the TC25 omni mics supplied here are no exception. Rigged as conventional spaced mics above an average jazz-oriented drum kit, they delivered a pleasing, natural, and spacious sound, with lots of subtle transient detail and finesse. Of course, such a minimalist miking arrangement really works best within a good-sounding room, but even when the mics were placed low over the kit in a particularly dead room the detail and resolution of the kit was excellent, and a little reverb ambience was all that was needed to produce a well-balanced and natural sound. Additional mics over the snare and toms can be mixed in with the omni overheads without problems for a more rock-oriented sound. Where a more natural stereo image of the drum kit is required, the live version of Earthwork's mic set might be more appropriate. The SR25 cardioid mics can be arranged as a coincident pair above the drummer to provide a continuous and accurate stereo image of the kit. The SR25 kick-drum mic connected through the Kickpad and placed towards the edge of the drum shell provided a powerful, weighty kick drum sound with a good clear clicky edge to help it really cut through in a mix. The fixed EQ of the Kickpad is sufficiently broad to work well with any bass drum, and a little fine-tuning with the console EQ can be used to shape the sound further if required. I also tried out the Kickpad with an Audio-Technica AT2500 dual-element kick-drum mic and found it very effective in delivering an 'instant rock kick' sound from this unusually neutral kick-drum mic. 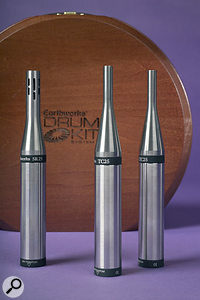 The DK25/L's manual reminds owners that the mics can be used for instruments other than drum kits, and they certainly can, although the relatively high noise floors preclude distant-miking techniques. The SR25 cardioid delivered good results when close-miking an acoustic guitar — giving detailed, transparent transients and a smooth neutral character — and I would anticipate similar results with other naturally percussive instruments. The bass falls off rapidly with increasing distance because of the proximity effect, but this didn't cause me a problem in practice. The TC25 omni mics are just as good — working particularly well inside a grand piano for pop and rock contributions — but are obviously more susceptible to room reflections and colorations than the cardioid mics. More versatile than many dedicated drum-mic sets. Available with cardioid overheads as the DK25/L set. The Kickpad adaptor can be used with other mics. Supplied in unusual and attractive wooden case. Maximum phantom power current demands. This unusually versatile kit is primarily intended for drum recording, but the transient clarity of the mics makes them ideal for any percussive instrument, including guitar and piano. DK25/R kit, £1410; DK25/L kit, £1410; SR25 cardioid mic, £468.83; TC25 omni mic, £468.83; Kickpad adaptor, £82.25. Prices include VAT.